In Hawai`i, forest birds have long been treasured as a symbol of the spectacular and exceptional ecosystem found only here. Their colorful feathers and birdsong have dotted the forests across the main Hawaiian Islands. The feathers of forest birds were used to adorn the ornate and lavish ceremonial clothing of Hawai`i’s royalty. 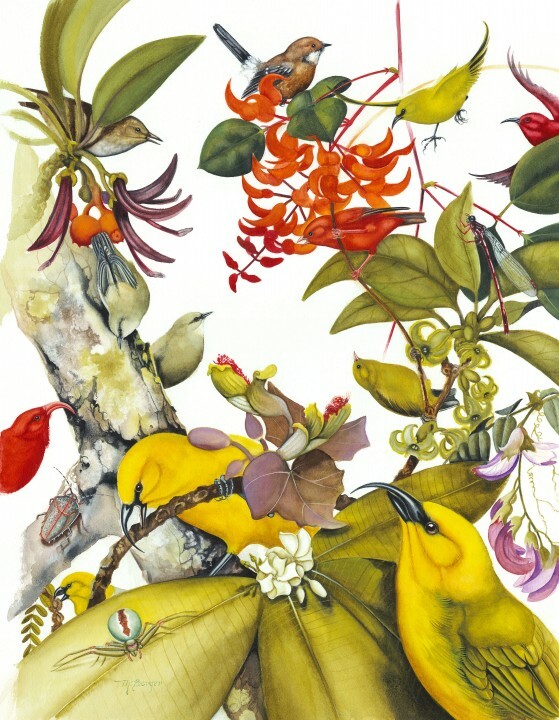 Forest birds were also the focus of Hawaiian mythology, as symbols of wisdom and strength. Sadly, Hawai`i’s forest birds have been threatened for years due to human-driven threats, including habitat loss and introduced competing and predator species that impacted the bird species. With the multitude of threats facing the native forest birds already, how will climate change impact these precious species? This PICCC Story Map will take you through the threats, challenges, and opportunities for forest birds in Hawai`i. The story map also provides a preview of how the management community is coming together through the PICCC’s Hawaiian Islands Terrestrial Adaptation Initiative to develop shared tools and drive larger conservation strategies across the Hawaiian Islands.